Take a closer look at the teams in group B of ESL One Katowice 2018 - who will make it to the playoffs? Less than a week is left before the official start of the ESL One Katowice 2018 powered by Intel group stage, and while we had a look into Group A, let’s put Group B under the microscope. From the looks of it we can look forward to some of the most interesting matches of this Major! Right off the bat we start with one of the event’s favourites, and honestly, who can deny that. Alongside TI7’s finalists, Team Liquid and Newbee, Team Secret have been performing outstandingly well and are also leading the charge at the Pro Circuit Ranking with over 4000 points. Their barrage of Top 5 place finishes in combination with their incredible 66% win ratio (since last August), comes to prove that they are rightfully amongst the top 3 contenders for this Major! The South American competitive Dota scene is evolving and Infamous are the living proof of this, period. They qualified to ESL One Katowice 2018 after a quick and confident win over their fellow South Americans rivals, SG e-sports. Despite that though, chances are stacked against them in this Major. Not only did they get into the, admittedly, hardest group, but they also got drawn to play against Team Secret right off the bat. Even though this is Dota and upsets happen all the time, it would be really hard for Infamous to outdraft and eventually best Secret. LGD are really strong, yet also really shaky. It feels like even though they have an undoubtedly strong roster with immense individual experience, they fall behind on teamwork, and their barrage of intermediate results, with some short moments of glory, come to prove it. They had three consecutive 8th-10th finishes - Perfect World Masters, MDL Macau and DOTA Summit 8 accordingly- and then out of nowhere they came second in i-League Season 4, succumbing only to TI7 winners, Team Liquid. 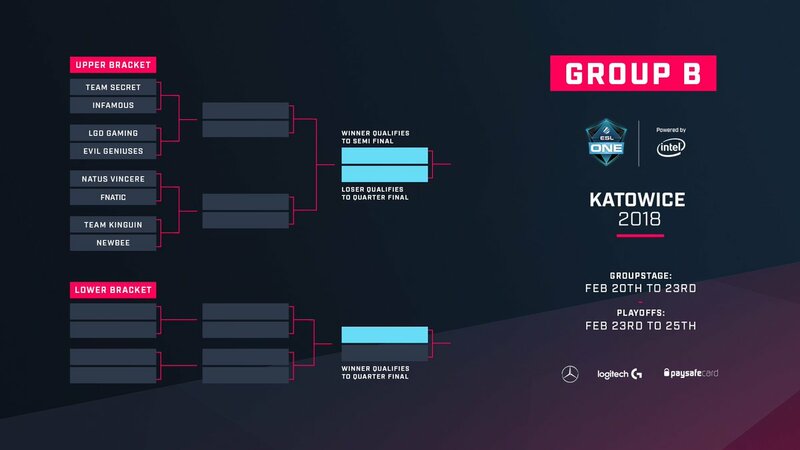 Taken all of the above into consideration, it is really hard to predict how LGD Gaming will perform in Katowice next week. I’ll stick with what I said about Evil Geniuses roughly a month ago when they were announced as a direct invite to Genting: “Evil Geniuses is a team with respectable force that has to be reckoned with”. In December 2017 EG underwent a series of roster changes, with the most notable one being UNiVeRsE’s release and the recruitment of Misery as their 5 and new team captain.Changes that have just started to prove their significance. Despite their mediocre finish at Captains Draft 4.0, EG finished 2nd at Galaxy Battles II and 3rd-4th at ESL One Genting 2018, thus proving that they are on the right course in restoring themselves to previous glory. They still have a long way to go through to reach TI5 levels of competitiveness. At their first match in Katowice they are going to go head-to-head with LGD Gaming and immediately after Team Secret will likely be waiting for them, that is in case they both win of course, an obstacle that might prove critical on their way to the playoffs. It has become evident to almost every Dota fan that Na’Vi are trying their best to come back to the foreground. They got a golden medal at the Adrenaline Cyber League and two respectable 4th place finishes at MDL Macau and DreamLeague Season 8, but they are just not quite there yet. Their poor finish over at Genting last month lead to them sending RodjER to Virtus.pro and receiving Lil in exchange while also replacing SoNNeiko with LeBronDota. With this whole fuss taking place just 20 days before Katowice, it is still uncertain as to whether they will be able to fully prepare for what’s coming onto them. If this was an ideal world, I could have ended my statement about Fnatic with just this phrase: “Fnatic added UNiVeRsE and they are now rocking”. But this is not an ideal world and Fnatic, unfortunately, are still not quite rocking. At least not as much as we would expect them to be. Their barrage of mediocre results during 2017 rung the danger bells, telling them that the roster had to be revamped in order to climb out of these poor performances. Fnatic were missing the link that would bind together the immense experience that they possess, and they quite possibly found it in the face of UNiVeRsE. A decorated veteran, with tons of experience on his back joined the team early on January but up until now they seem like they haven’t found a way to fit it all together. But hope is not lost for Fnatic as this roster has all the ingredients needed for their chemistry to click. Hailing from Poland, Team Kinguin will be the home contenders, the ones who will try to keep the title in Poland! Over the past 7 months they have exhibited a steadily upward trend, with their most notable result being their 3-4th place finish at DOTA Summit 8 and their 5th-6th finish at Perfect World Masters, thus making them a venerable force in EU. Much like compLexity Gaming and Infamous though, they still have a long way to go before they are able to compete at the highest level and go head-to-head against teams like Liquid and Secret. Additionally, the fact that their first match is against Genting’s champions and former TI winners, Newbee, could prove as an early stumbling block. Newbee’s direct invite to Katowice shouldn’t really surprise anyone. Newbee had an impeccable run in 2017 and early 2018, seeing a series of top 5 finishes, which culminated in their golden medal at ESL One Genting 2018. Their win over Team Liquid further solidified their presence, thus making them one of the top 3 contenders for this Major. Taking into consideration the level of gameplay they’ve exhibited over the past year, one might safely assume that they are not far from returning to China with one more top 1 finish on their backs. Tickets to the event are available so be sure to join us for Poland's first ever Dota 2 Major held in the legendary Spodek arena! For all updates, follow ESL Dota 2 on Twitter and Facebook.